Mix together flour, 1/4 C sugar, baking powder, and salt in a bowl. Cut in the butter with a pastry blender or fork until mixture resembles coarse crumbs. In a small bowl, mix buttermilk, egg and vanilla. Add to dry ingredients all at once, stirring until mixture is moist. On a floured board, knead gently a few times, but not too much. Form into a 8″ round patty on an ungreased cookie sheet, cut into 8 wedges with a knife. 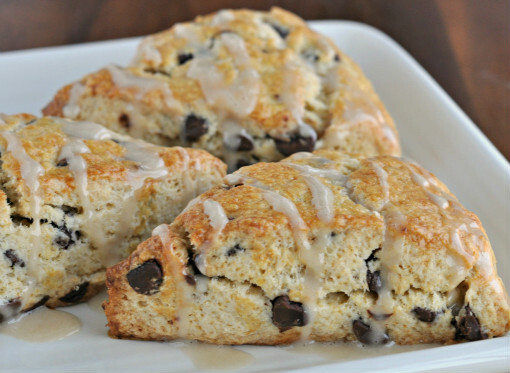 Whisk together powdered sugar, and orange juice into a glaze; drizzle over warm scones. Separate scones and serve warm.